We are delighted to send you our latest newsletter. We have been busy and have lots to tell you! Remember that Jacob Jensen Design is on Facebook and Instagram where you can follow our daily activities and get news, inspiration and a look behind the scenes from our global design studios. Over the past 30 years, Jacob Jensen Design has created an extensive collection of consumer lifestyle products under the trademark of JACOB JENSEN. Last year, the company took a step further into developing a category of products for well-being and surveillance. 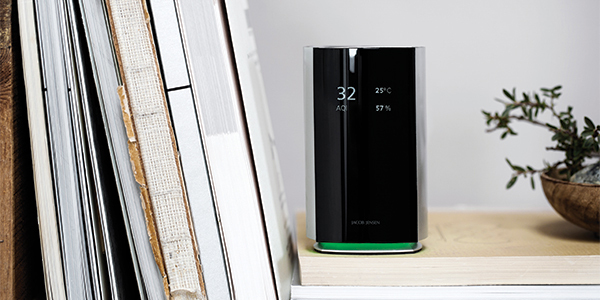 The first product set for roll-out is the JACOB JENSEN Air Quality Monitor that measures and displays indoor air quality as well as humidity and temperature, providing a clear overview of the indoor climate in our homes and offices. 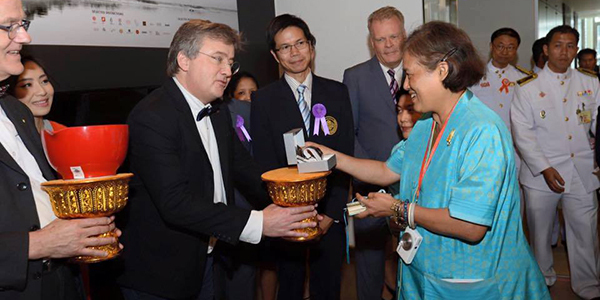 Her Royal Highness Princess Maha Chakri Sirindhorn of Thailand was presiding at the inaugural ceremony of the Knowledge Exchange Centre in Bangkok where our studio is located on the 15th floor. We were privileged to be among the few selected businesses that Her Royal Highness visited. The Knowledge Exchange Centre is a new venture by one of the leading universities in Thailand and Southeast Asia, King Mongkut’s University of Technology Thonburi (KMUTT). The centre serves as a community for knowledge exchange, entrepreneurship, partnerships and innovation alliances. Jacob Jensen Design has been operating in Bangkok since 2012 providing creative services for companies in Southeast Asia. Danish design at its finest merged with the latest in innovative technology: Jacob Jensen Design have showcased their newest design piece, the HALO Smart Bracelet. 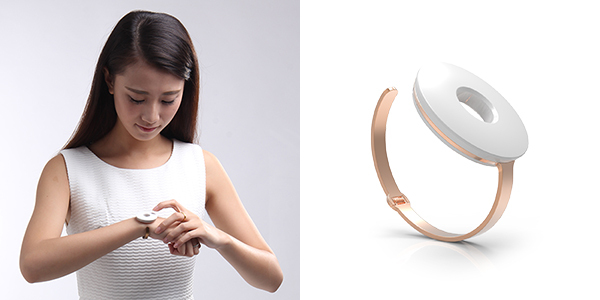 A fashionable woman’s bracelet that connects with a smartphone and features gesture recognition technology as-well-as emergency safety positioning. The smart functionality is not visible but built into the design. The HALO Bracelet focuses on one specific function: emergency safety. The bracelet is paired with the user’s smartphone via Bluetooth and allows the user to activate an S.O.S. distress alert. The alert is transmitted by the user’s smartphone to her assigned contacts. A piece of jewelry that looks out for your loved ones. The bracelet was presented at MWC, Barcelona and Baselworld, Basel in earlier this year. Click here to see the video about the design of the Halo Bracelet. 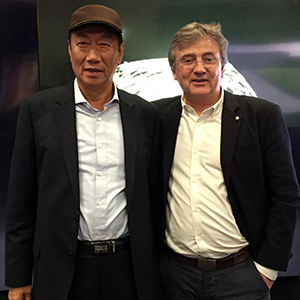 Terry Gou, founder and Chairman of Hon Hai Technology Group and his C-level team invited Timothy Jacob Jensen to meet up at Sharp in Osaka. The purpose of the meeting was to discuss various topics from I.o.T (Internet of Things) to strategy and design DNA, but it was also an opportunity to get acquainted. Electronic Parking Disc II wins TECH TEST! 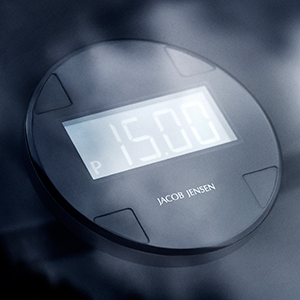 The newly launched JACOB JENSEN Electronic Parking Disc II has won the Danish TECH TEST Gold Award. The product was particularly praised for its easy-to-read display, its functionality and its overall design. Click here to see the results of the test (in Danish). The JACOB JENSEN Electronic Parking Disc II is distributed by EET Europarts. 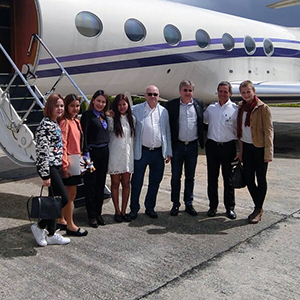 Per Enevoldsen, founder of the Danish jewellery brand Pandora serves as steering committee member at Jacob Jensen Design | KMUTT Bangkok. In October 2015, Timothy Jacob Jensen and his eldest daughter, Toko, took a philosophical journey with Enevoldsen and his entourage to Buthan where, among other achievements, they climbed the Tiger's Nest together. Design Thinking for Branding, Strategy and Entrepreneurship: Our CEO & Chief designer, Professor. Timothy Jacob Jensen, has performed yet another of his inspiring lecture. This time to a full auditorium at the China Europe International Business School (CEIBS) in Shanghai. Contact us for more information about lectures and workshops. 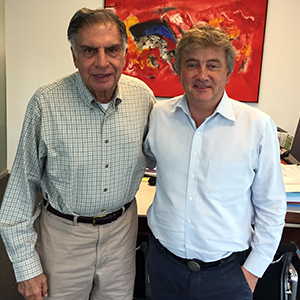 Timothy Jacob Jensen was invited to meet with Mr. Ratan Tata to discuss opportunities of opening a Jacob Jensen Design studio in cooperation with an Indian-based university partner. Ratan Tata, the Indian businessman, investor, philanthropist and chairman Emeritus of Tata Sons was the chairman of Tata Group from 1991 to 2012. Today, Mr. Tata continues as the chairman of the group's charitable trusts.